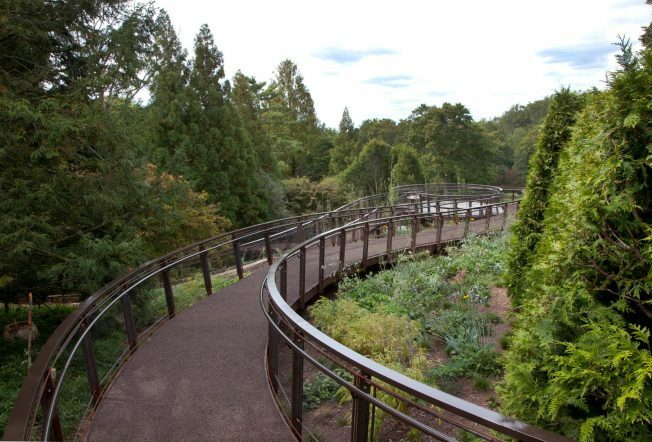 Martha Stewart called Chanticleer Gardens "breathtaking," so you know it must be good. The gardens, located in Wayne, Pennsylvania, date back to the early 20th century, featuring 5,000+ plants and 35 acres of gardens. Seven horticulturists are responsible for the design, planting and maintenance of specific areas -- they basically keep everything looking fantastic for your viewing pleasure. Inside the grounds, you'll find many varieties of trees and gardens, including the Asian woods, a pond garden, a ruin and gravel garden, a teacup garden, a tennis court garden and a woodland area. Brand new is the elevated walkway with two viewing platforms and staff-made White Oak furniture. At its highest point, the walkway is eight feet above a blooming meadow where a grove of quaking aspens runs through it. Sounds magical, right? We've been told the gigantic Katsura Tree in the middle of the garden is a must-see. Chanticleer Gardens is located at 786 Church Road in Wayne, Pennsylvania, about two and a half hours from downtown D.C. It's open Wednesdays through Sundays, 10 a.m. to 5 p.m. From May through Labor Day, the garden is also open Friday evenings until 8 p.m. The 2015 season begins April 1 and ends Nov. 1. Admission is $10 for those age 13 and older, and free for kids age 12 and younger. Members of the Pennsylvania Horticultural Society and local arboreta get in for $8; Radnor Library cardholders get in for $5. Garden professionals are admitted free.